1.Bring a wide, deep frying or sauté pan of water to the boil. Meanwhile, finely chop the parsley then beat it into the softened butter with a little salt and pepper plus nutmeg to taste — up to ½ tsp. Set to one side but do not refrigerate. 2.Add the asparagus to the pan, reduce the heat and poach or simmer slowly for about 6 minutes or until tender when pierced with the tip of a sharp knife. 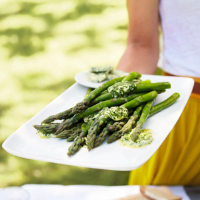 3.Drain the asparagus and serve with blobs of the parsley butter melting over it. Use the woody ends of the spears that you didn’t snap off to hold the asparagus as you eat it.